Definition at line 9 of file CRESettings.h. Definition at line 7 of file CRESettings.cpp. Definition at line 11 of file CRESettings.cpp. Definition at line 48 of file CRESettings.cpp. Referenced by CREFilterDialog::CREFilterDialog(), and CREResourcesWindow::updateFilters(). Definition at line 60 of file CRESettings.cpp. Referenced by CREReportDialog::CREReportDialog(), and CREResourcesWindow::updateReports(). Definition at line 43 of file CRESettings.cpp. 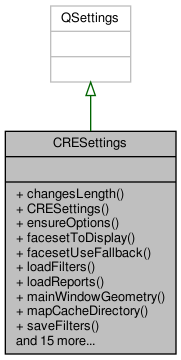 Referenced by CREMapInformationManager::clearCache(), CRESettingsDialog::CRESettingsDialog(), ensureOptions(), and CREMapInformationManager::storeCache(). Definition at line 53 of file CRESettings.cpp. Definition at line 65 of file CRESettings.cpp.